Cass Knits! Sweaters and socks and wool, OH MY! Yarns about knitting and family Cass Knits! | all day, every day. Sometimes she stops to shop. 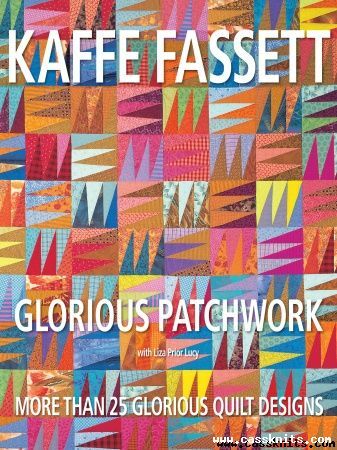 » Kaffe Fassett is a color genius! Kaffe Fassett is a color genius! Now, I know that most of you knew that already, but I sat down this afternoon with his new book, Glorious Patchwork, and I have to tell you I was enthralled. Enthralled. I had heard the name in knitting context often enough, and read what others had to say about his work, but this was my first experience with Kaffe, and as I turned the pages, I kept thinking, ooh, wow, ahh, wow wow wow wow wow wow. Did you know that in addition to quilting, which is the subject of this book, and knitting which is all I thought he did until today, he also designs for crochet and needlepoint AND he paints? The man is seriously intimidating. Not that the book had that effect on me *ahem*. Isn’t that fabulous? I would love to be that colorfully courageous! I know that I will look at this book again and again for inspiration. There are chapters, each dealing with a different color family: Soft Pastels, Circus, Leafy Gardens, Antique Stone and Renaissance. Each chapter has exquisite quilt patterns, plus great photos of those quilts in totally amazing (and coordinating) rooms. This is not a book to keep hidden on the shelf. This one needs to be on the coffee table, maybe under glass, but definitely on display.